It never occurred to me to consider whether the food I was eating was dead or alive. The only foods I can wrap my head around being alive are the chicken, bacon from the broccoli salad, and the cheese (because it came from milk and the milk came from cows). But we’re not serving up raw chicken. Not only do I NOT want to nurse a case (or four) of salmonella, but can imagine the looks you’d get at the dinner table if you served a live chicken? Not a pretty site. I’m fairly sure my grandmother would have fallen out of her chair. Apparently, there are some foods that are better for you when eaten raw, unlike chicken. Seeds, grains, nuts and beans we find in stores were once “alive” plants. They all come from trees or plants or stalks of some sort and when they were alive, they contained active enzymes. These enzymes caused the vitamins and minerals within to help the plant grow and produce the food we recognize. When the foods are picked or harvested, enzyme inhibitors take over and block the enzymes. Consider it nature’s way of protecting the food’s ability to grow and reproduce until the conditions for germination are right. What we are left with is food that contains enzymes in a not-so-helpful, dormant state. It doesn’t sound like a big deal – so what if the seeds are preventing themselves from germination? We’re just trying to make bread right? Not grow stalks of wheat. What we fail to realize is that active enzymes increase vitamin content dramatically (Vitamin B and carotene) and even produces some vitamins that are not available when the enzyme inhibitors are in place (Vitamin C). Remember the issue with phytic acid? It’s also present in seeds, grains, nuts and beans and it hinders absorption of several key minerals. It almost seems like these foods shut down once they’re harvested. Minerals are blocked, vitamins are diminished and even cease to exist and our bodies recognize this too. Ever have problems digesting grains (and not because of gluten)? I have. Just these past two weeks my gut has been a little bit more disturbed after eating wheat bread (homemade, but no sprouting or soaking). For all the benefits that it provides, sprouting is really, really easy. Easier than making sourdough starter, and that’s REALLY easy! The process is the same for all seeds, grains, nuts and beans: soak, rinse, wait; rinse, wait and repeat. Measure almonds into a quarter jar. Fill with filtered water and cover with a coffee filter, securing with just the ring of the lid. Allow the jar to sit on the counter overnight. The next morning, remove the ring and coffee filter and drain the water from the quart jar. 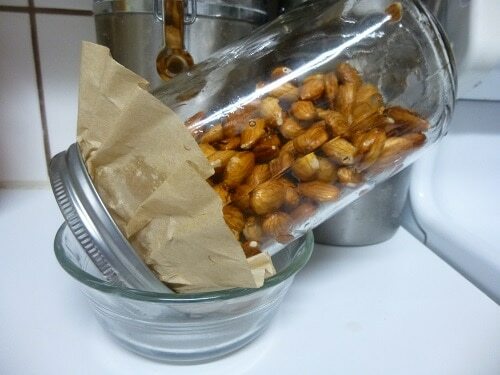 Fill the jar again with fresh filtered water, swirl the almonds and drain the water. Replace the coffee filter and ring and using a small bowl, store the jar at an angle so excess water can drain out and air can circulate inside the jar. Repeat the above step each morning and night until the almonds begin to sprout. The above picture was after only one day of soaking. Here are some additional pictures of the process. This is the jar of almonds after one day. Little sprouts are trying to poke through the tips of the almonds. Here’s another almond beginning to sprout after day two. After two days, the almonds were beginning to swell up. You can see how the almond is beginning to outgrow its shell, so to speak – seen by the cracks at the bottom and along the sides. 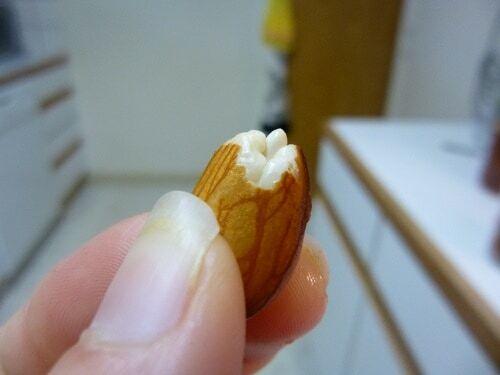 If you crack open a sprouting almond, this is what you’ll find. Once all the nuts are sprouted, store them in a jar in the fridge for a few days or dehydrate them into crispy nuts. 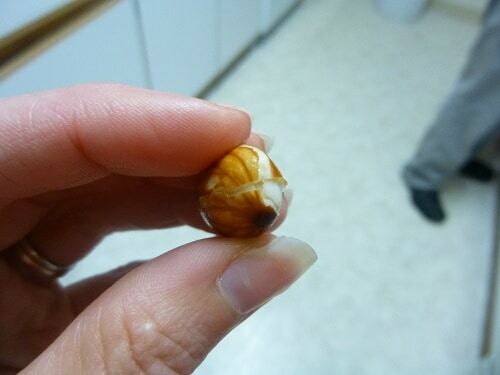 The sprout itself will look different depending on what seed, grain, nut or bean you’re sprouting. Some grains will produce small, white sprouts. Lentils are fully sprouted when the “tail” reaches 1/4″. Mung beans will grow 2″ long sprouts! The process works with nearly every seed, grain, nut and bean, with just a few minor exceptions. My Food is Alive – Now What? Once you sprout grains, you can use them immediately in dough recipes. Or you can dehydrate them to make flour (even without a mill). You can eat nuts and seeds wet or added to smoothies to boost protein. Or you can dehydrate them into crispy nuts or crispy seeds. Another option is to dehydrate and grind nuts into flour or meal for recipes (almond meal is an easy way to boost protein in a standard granola bar). Sprouted beans can be soaked to reduce phytic acid even more, and then cooked over several hours on low. I use this method here for soaking and cooking. And sometimes even cook in my slow cooker! At the end of the day, if I can increase the nutrients my family eats, I’m all for it. Because if I can get them to eat beans, then I want them to get everything they can out of them! What’s your experience with sprouting? Do you think it’s something you could incorporate in your kitchen routine? Cooked Beans or Dry Beans, Which is Cheaper? Could you please clarify which nuts can be sprouted (or how)? With pecans or walnuts, do they need to be left in the shell to soak or are you not able to soak these at all? Thanks! The following nuts are capable of sprouting for sure: almonds, cashews, macadamia and peanuts. Walnuts and pecans would still benefit from a soak (with more coming on that tomorrow), but they won’t necessarily sprout (although some people do claim they will). If skins/shells are removed through a high-heat processing (boiling, roasting, etc.) all the enzymes are killed and the nut will not germinate. Try to buy “raw” nuts if possible, but definitely avoid boiled or roasted nuts if you intend to sprout (b/c it won’t work!). If you attempt with pecans or walnuts, just know that the sprouting results are hit/miss, depending on how the shells were removed. Here’s what I would do: Soak the nuts in a warm, salty bath overnight (specific process coming tomorrow). Drain in the process above for one day. If you start to see new life, some germination in even one seed or two, continue. If not, dehydrate them into crispy nuts. Cashews will not sprout, though all the nuts can be soaked to improve digestibility. Cashews that you buy as raw are not truly raw. Cashews are not edible raw. They are also a legume. Love sprouted almonds! I never liked almonds until I soaked them for my husband, and all of a sudden I was eating them up,too! Also, they smell better. I always wondered why almond extract smelled like it did, but now I realize that the soaked almonds have that smell. Thanks for the demo! I was inspired by this post; and immediately set my raw almonds to sprout. (I don’t know why I haven’t done this sooner!) Unfortunately, it’s been 4 days, and the nuts haven’t sprouted. Do you think I should give up on them? Maybe just dehydrate and eat them as is so they don’t go to waste? Or should I give them a few more days? If you don’t see sprouts and it’s a full 4 days later, your almonds are likely not raw. Extreme heat is the only culprit that I know of that would kill the enzymes to the point of being unable to germinate again. I’d dehydrate them and eat them to prevent waste. No sprouting at 4 days w/almonds means you probably won’t. Can I ask where you’re buying your almonds from? Lucky me, I was set out to read more about sprouting, and I found this post next! First off, your broccoli salad looks amazing, and I am pretty sure I will be making it for dinner tonight (just pinned it, too!). Between my daughter and me, we are allergic to almost every nut 🙁 But it is really interesting viewing food as alive, and that it increases the nutritional content. I have the philosophy that the closer our food is to its natural state, the healthier it is. The broccoli salad makes great leftovers too. Don’t forget that sprouting works on beans and grains too! 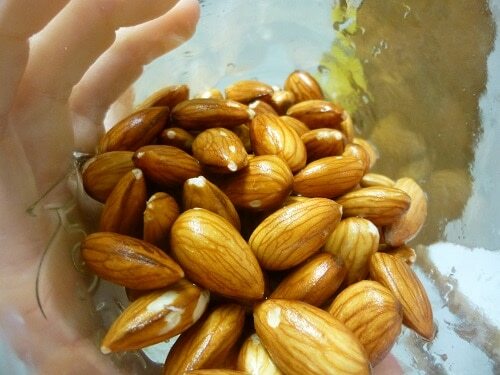 I currently soak almonds to make (very easy) almond milk…. any issues to sprout them and then make the almond milk? Thanks for your time! Soak 1/2c to 1c of almonds overnight (amt depending on thickness desired or budget). In morning, drain and rinse. Put into blender(or food processor) with 2 cups water, add a few dashes of real salt. Blend until no chunks remain (a few minutes with a cheap blender. Using something to strain the meal out (a milk (nut) bag is ideal, fine mesh strainer, cheesecloth layered many times, etc) and a med sized bowl or lg measuring glass to catch your liquids; pour out the blender contents and separate the almond meal from the milk. Put the concentrated milk into your 2qt container and add water to make the 2 quarts. ****all done**** this would be unsweetened almond milk. **If you are used to buying your almond milk you may want to add a sweetener, vanilla and gar gum or glucomannan powder to thicken it. I love using those leftover almond grinds for granola bars. Delish!! Can I use the leftover almond grinds resulted from the milk to make almond butter in the food processor? Do i have to dehydrate them first? I would dehydrate them first. They’re on the wetter side, so if you make almond butter, it’ll be on the runnier side (with the excess water) and you’ll have to store it in the fridge too. If you don’t want to dry, you can just stir some into oatmeal, bread or into the dough for crackers. Nope, shouldn’t be any issues as long as you refrigerate the milk (which I’m assuming you do). You’re most welcome Jenn!! That’s really cool! 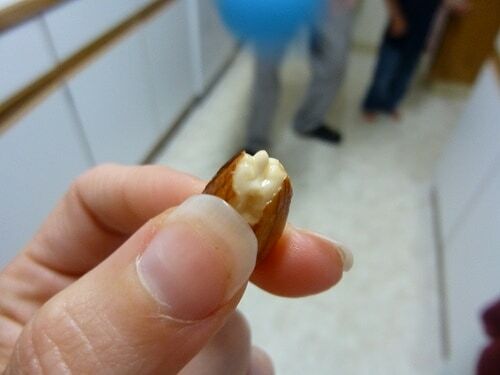 I would have never thought to sprout almonds. I’m hearing so much about the benefits of sprouted food, though! Thanks for sharing! I kind of want to go plant an almond now…haha. I tried sprouting almonds, but was unsuccessful. Later I found that all almonds sold in the US are pasteurized. Can you let me know from where can I purchase raw almonds? Thank you. Thank you, Tiffany. I will check at Costco. Do you get any specific brand or is it Kirkland? Thanks, again. Regular ‘ol Kirkland! 🙂 You’re welcome! I also have had success with Kirkland almonds. We love the taste of soaked dehydrated walnuts too. Taste way better after an overnight soak in salt water. I was wondering about pinto beans. 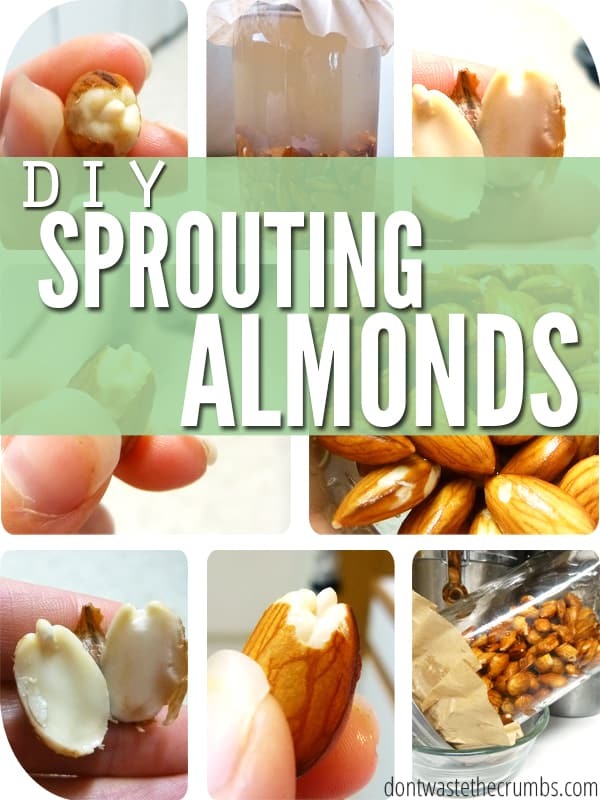 Do you use the same process as sprouting almonds then cook. My family is from the southwest and we love our beans and chile….however the beans don’t love us…ugh! It’s been 24 hours and my almonds just started sprouting so excited I never heard of this before. Only problem is – when I started this process I didn’t realize your suppose to let them rest without water. I’ve kept them in water this entire time will it make the almonds bitter? I have been soaking my almonds for last 5 years and I take it with home made yogurt, fruits, almonds just 5 pcs only in the morning, It is very good for the brain. I also planted one almond in a pot of dirt and it is grow so good, Now I have transplanted the almond tree in my backyard. Hope it will give me some fruits of almond. It is 4 feet now. Interesting. Let me start by saying that sprouting nuts is not a simple process… it’s a science! Almas (above)has discovered how to start a seedling. This process is what every almond grower does to create the very beginning of a seedling by getting it to sprout. He then buries it in some dirt and waits for a seedling to appear. From a nutritional standpoint (I won’t address taste), virtually nothing has changed throughout this “process”. value. A raw almond has an average Ph of 6.1 which is acetic. To our knowledge, of the “sprouted almonds” we have tested in the retail market-place (certified by an independent laboratory), none have exceeded Ph 6.2 to 6.3. The most important nutritional/enzyme end result is to reduce the amount of phytic acid, which would increase the bio-availability of the almonds nutrients. This can’t take place in an acetic environment. Our proprietary procedure has produced a Ph of 7.2 and reduced the phytic acid level by roughly 50%. We are in the process of moving from the limited sized testing levels to full production levels and should soon begin selling to the public in 1st quarter 2014. I have a question about pasteurized almonds – does the process (chemicals, hot heat) destroys lectins, phytic acid.. Soaking is useles then? I beg to differ. Neither the enzymes nor the photic acid is destroyed by these two processes. The steam pasteurization is not hot enough to destroy the enzymes or unfortunately, the phytic acid. The main goal of “sprouting” (see my mini thesis above) is to lower the phytic acid levels, thereby increasing the amount of the almond’s nutrients your body can absorb. The only condition that you must address is that the nut has to be the most recent year crop in order to “germinate” successfully. Ps to Urska. The enzymes are still there but just soaking will not increase the bio-availability. Hello there. 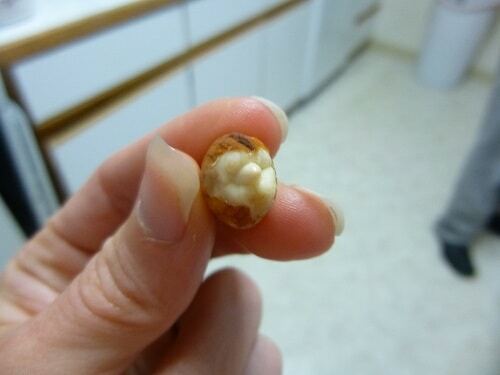 Thank you for posting the process of sprouting nuts – really helpful as I am new to this. One question – at what temperature should we be dehydrating the nuts? I keep reading conflicting information, some sources state no more than 105 F or no more than 118 F. Would you happen to know? Thanks! Hey Tiffany, I know that all almonds and nuts are pasteurized in USA by law, can you still sprout pasteurized nuts, or u buy them overseas and sprout them? Also which method is better for digestion sprouting or soaking? Hi Skirmante! It depends on the type of pasteurizing the manufacturing does. I buy my nuts from Costco and they must be low-temp pasteurized because I’m still able to sprout them. Either method is fine for digestion, although sprouting gives new life to the tiny enzymes, so you’ll get a bit more nutrition. I would like to know if it is possible to make rice milk without boiling the rice first but by soaking the rice overnight and then blend it with water. Dead animal meat is not alive. Hello, how are you? After I dehydrate the nuts for 24 hours at less than 115 degrees fahrenheit and make them into butter. How longer before it goes bad?? Hi Deandra! I’d say you have a week or two for the soaked nut butter – be sure to store it in the fridge! Do you know if almonds pasturized by the STEAM method can still sprout? Thanks. appreciate ALL the info. Another question (sorry) – are there regulations as to the max temperature of the steam when almonds are steamed pasturized? I would think if the temp was too high it might damage the nut. No need to apologize! I’m not sure if there’s regulations Carrie, but I’m sure there standards. A quick search yielded a temperature of 200F with “short bursts of steam.” That definitely warrants more research, but in the mean time, it’s way better than the chemical pasteurization process. If you’re able to get raw almonds from a local source, then I encourage you to do so. Although the ones at Costco are pasteurized, I’ve been able to sprout them without a problem! Hello, I’m a little confused about the process. 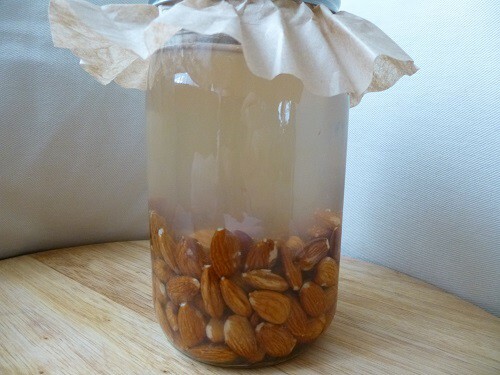 After the initial soak, drain, and rinse, do you leave the almonds in a jar without water for a couple of days to germinate or do you soak them again? Technically, almonds are seeds. They are not tree nuts like walnuts and pecans. Adding the word “raw” to your recipe above, e.g. “2 cups raw almonds,” might save your readers some frustration. I recently became a devoted nut sprouter, and I’m making homemade almond milk once a week from a simple recipe I adapted from one found online. You’re so right, the soaked, sprouted almonds are 10 times more delicious and (for me) digestible than roasted nuts. You can taste the sweet life force. I’m going to try sprouted cashew milk next! Thanks! Hi Kerry! The reason I didn’t add raw to the ingredients is because the majority of nuts sold in the US are from California and the state requires pasteurization (the type left up to the manufacturer). So, the chances of your nuts being truly raw are not high, BUT at the same time, I’ve bought almonds from Costco that weren’t raw and sprouted them without a problem… see the dilemma? But LOVE sprouted nuts! You reminded me that I need get back on this band wagon. Thanks Kerry!! Hi! I am a little unsure on how to do this. Do you soak the almonds in water EVERY night, or just the first night, but rinse the almonds in fresh water every morning?? Thanks! Hi Carly! You fill it with water on the first night, then rinse each day after. Thanks! One more question…I have been doing this, and this morning I woke up to a spider web looking stuff around them…assuming it is mold of some sort. Is this supposed to happen?! Are they ok to eat? I threw mine out too. I sprout seeds all the time. Before I try sprouting almonds again, I’ll look for a source that doesn’t pasteurize them. Interesting Melanie… do you have any links to research articles to share? I’d like to read more on this! Can you please let me know what your sources were for this ? I have not been able to find specific chemical analysis of seeds/nuts/grains before and after sprouting to validate this. Hi Iza! The short answer, yes – boiling sprouted will kill all the enzymes. When you bake bread, the temperature of the bread reaches 220F. This is high enough to kill some enzymes, but not all of them. There’s also the idea that sprouting actually changes the make-up of the food itself, so that in a sprouted state, the food is more easily digestible. I hope this helps!! Thank you for your answer! So would you say it’s pointless so sprout the almonds if you’re going to make yogurt out of them? Or are there still some benefits? You’re welcome! There are still some benefits, and you can make yogurt from raw milk while heating to only 105-110 which doesn’t kill the enzymes. Is there a reason for heating the milk any higher in your recipe? If not, I’d start with a lower temp and see how it turns out! Is there a procedure that we can do to get rid of PPO as I buy Kirkland brand too ? Not that I know of Khulud. Hello, Tiffany. I soaked some Blackeyed Peas and they sprouted. They taste rather nice. But I am concerned whether or not they are a GMO. When I buy Blackeyed Peas in the store, is there a way to tell if they are GMO? Hi Tom – the only way to know if they’re non-GMO is if the package states so… it would be labeled, similar to how organic is labeled. If you don’t see it, then it’s not non-GMO. Hi there, can you clarify the process. I’m supposed to only fill with water the 1st night then rinse and let drain at an angle all day/night until the next morning rinse again and drain all day/night? Is that correct? What temperature should they drain at? I live in Hawaii and it gets pretty hot here. Should I do this in the refrigerator? Thank you! Hi Hawaii3s! You are correct. They should drain at room temp, 68-80 degrees. If it’s warm in the house, maybe find a cool spot in a pantry? The fridge might be a little too cool. If anything, warm temps will just make the process go faster! 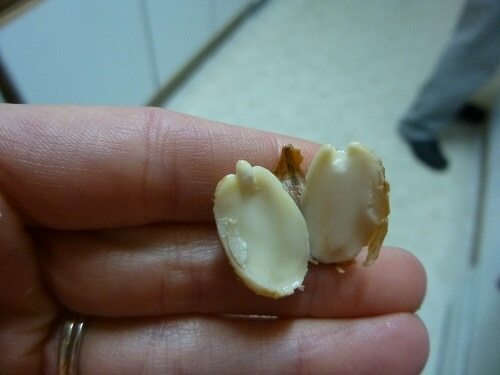 Have you ever used sprouted almonds to make vegan nut cheese? I’m going to try it. I make fermented almond cheese. I bulked up on organic raw almonds when they were on sale at our local health food store and promptly put them in the freezer. Will the thawed-out raw almonds sprout? Hey Tiffany! I know this is an older post, but I just wanted to let you know I appreciate all the time and energy you put into making this post and all of your other posts as well! I’m restarting my journey to wellness and since it’s been about a year since I last sprouted almonds, I searched for a how-to and came across your blog! I noticed a lot of people asked about PPO and were looking for an alternative. Fred Meyer and Trader Joe’s bulk almonds both use the steam method; my almonds from Fred’s are actually soaking as I type this. Also, buying at farmer’s markets lets you ask the farmer. I’ve gotten great deals on steam-pasteurized almonds from farmer’s markets in multiple states (not as low as Costco prices but below Safeway/Harris Teeter/Publix prices). Anyways, thanks again for the work you put into your blog! I know I’ll be reading from it quite a bit! Hi Tiffiny, i am teying to understand process of speouting almond. Why coffee filter required?. Can i close with jar lid for overnight?. Filter inside jar and close with lid?. Is it to get some air while soaking?